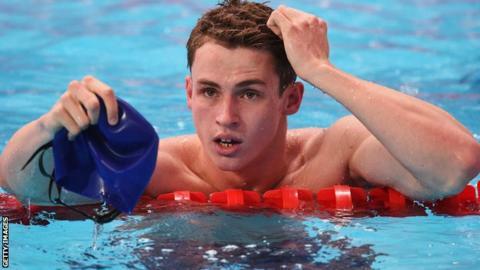 Ben Proud has broken Mark Foster's 14-year-old short-course 50m freestyle British record. The 21-year-old, who won two Commonwealth gold medals in 2014, swam 20.74 to beat the mark set by Foster in January 2001 by 0.39 seconds. "As soon as I nailed my turn, I knew it was going to be a fast swim but I didn't think it would be sub-21 seconds," Proud told swimming.org. The Plymouth Leander swimmer was racing at the ASA's winter meet in Sheffield. Two other British records fell at the meeting: Lizzie Simmonds swam the 100m backstroke in 56.35 seconds, while 16-year-old Imogen Clark recorded a time of 30.02 in the 50m breaststroke.